I’ll bet this one’s been on your radar: One Day and One Amazing Morning on Orange Street. Maybe you heard the buzz. Or noticed the stand-out cover. Or wondered about that long, interesting title. I was lucky to meet the author right after reading the book—always a dangerous situation. You want to convey how much you loved it. But you don’t want to overgush. Joanne would be gracious even if you overgushed. She even agreed to answer some questions about writing, orange trees, and messy friendships. Children’s Literature’s review of your book says, “This book offers a joyous, life-affirming take on the power of kindness and hope—and most of all, of friendship—to buoy us in times of trial.” And I wholly agree. But what I like best is the way Ali, Bunny and Leandra have a friendship that feels messy and true. How did you find that balance? Their friendships are exactly like the ones I had when I was young–honest, crabby, ecstatic, changing all the time, as we ourselves were growing. I’m not sure I could take the intensity of those kind of friendships as an adult. It is much easier to hide behind a more polite mask, but I feel fortunate to have had those immature but honest friendships while I was exploring what it was like to grow up. Interestingly, a few of my “middle-grade” friendships have survived into adulthood, and are very calm, loving and mature! What books spoke to you as a child? Do any characters stand out? Which character would you have liked to be your real-world friend? My all-time favorite character was Anne, of Anne of Green Gables. I’m from Canada, too, not that that was the main reason! I think every one of my characters has some of Anne in them, even the boys, but Anne, of course, can’t be replicated. Still, her effect on me, the first time a literary character so captured my imagination, has inspired me to strive for the uniqueness of “voice” every time I create my own characters. I was powerfully drawn to her love of words, rebelliousness, imagination, optimism, honesty, lovability, and HUMOR. I gobbled up every one of L.M. Montgomery’s books, following Anne to adulthood. She felt so real to me, and still does. Do you have a favorite literary friendship? See above! I should also mention another book, more contemporary, but not that contemporary (1969! ), one I love, which was an ALA Notable book a while back, and which I like to read over and over again, especially while I’m working on my own stuff. It’s also a story about a friendship. The book always reminds me to stay real and natural in tone, and to respect the true voice of each character. The tone of it is so humorous to me, only because it is right-on for the age, which is middle grade. Funny, but not always on-purpose funny. Funny because it’s true. And so poignant. Bet you’re wondering what the book is already…! 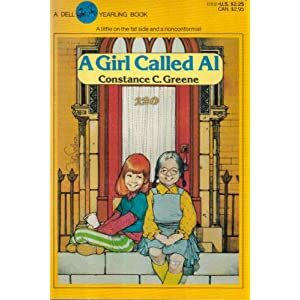 It’s Constance C. Greene’s short novel A Girl Called Al. What role do friends play in your writing life? Do you have a critique group? Friends who read your work? It gets lonely being an author…I love getting together with writer friends from L.A. and have been working hard at making “literary friendships” here in Oakland, my newish home. It’s been a joy discovering my fellow Erin Murphyites. I love, love, love talking process, and discussing the joys and pitfalls of the writing life. Reading my stuff to a group is another story. I have enjoyed being part of a critique group for the company and writing expertise, in general. But I have found it unproductive and often depressing to have isolated chapters of a novel critiqued before the whole thing is done. I’d rather just keep plugging away, make mistakes without revising them, and keep that first awful draft entirely to myself. Even my editor doesn’t see it–she only gets to read the second or third draft. When you’re finished with a manuscript, does any part of you long to write a sequel, so you can have more time with the characters? Or are you ready to be done with them? Do you think Orange Street might some day have a sequel? When I’m first finished with a novel, I can’t bear to put my characters through any more misery. I’d rather torture some new ones. That said, who knows? I may change my mind in the future. Yes, I do miss the characters from Orange Street. I am quite fond of them. A citrus-scented question: what made you write this book about Orange Street? After my mother died, I really didn’t feel like writing at all, and didn’t do much of it for a while. But when I finally did get seriously started on another novel, I knew I wanted to write about my beautiful old backyard orange tree, which represented both the past and the Magic Now for me,– and about the extraordinary beauty of the ordinary things in our lives which we often take for granted–family, friends, nature, and especially, community. Just try to find a better note to end on. You can visit Joanne’s website. Writers and procrastinators of all stripes won’t want to miss her great writer’s block blog. Thank you, Joanne. Like a perfect orange, this hit the spot. This entry was posted in Uncategorized and tagged A Girl Called Al, Anne of Green Gables, author, Constance C. Greene, EMLA, Erin Murphy, Erin Murphy Literary Agency, inspiration, Joanne Rocklin, L.M. Montgomery, literary friendship, middle grade, novel, Oakland, One Day and One Amazing Morning on Orange Street, orange tree. Bookmark the permalink.